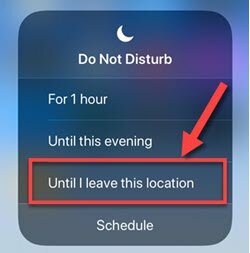 I attended a concert on Sunday and it clarified that my favorite new feature of IOS 12 is the set of improvements to Do Not Disturb. My normal routine if I go to a concert or movie is to use the slider switch on the left side of the iPhone to silence the ringer and put the iPhone on vibrate. In fact when the phone is in my pocket having my ringer on vibrate tends to be my normal routine. My iPhone is on vibrate mode a lot. However for this concert I wanted to try out a new Do Not Disturb feature that seems perfect for concerts, movies and church services. As I was taking my seat in the theater, I pulled up the Control Center, and pressed and held on the crescent moon Do Not Disturb icon and chose Until I leave this location. This action would suppress all calls and notifications until I leave the theater. It worked perfectly with no embarrassing notifications during the concert. And as I was walking about a block away from the theater after the concert, I glanced at my iPhone and saw that Do Not Disturb was off. 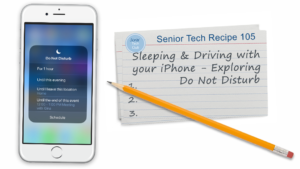 You can learn about all of the features of Do Not Disturb with this week’s featured recipe, Recipe #105 – Sleeping and Driving with your iPhone – Exploring Do Not Disturb.